"Generation Startup' hopes to inspire people to move a little bit outside their comfort zones and take more risks. 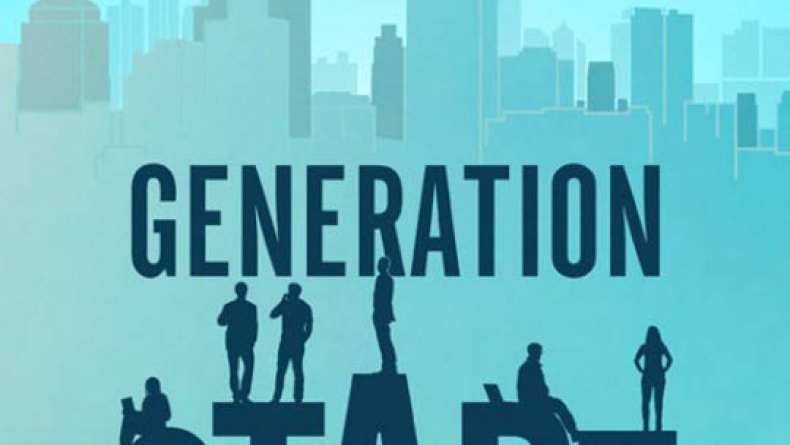 Generation Startup takes us to the front lines of entrepreneurship in America, capturing the struggles and triumphs of six recent college graduates (Dextina Booker, Kate Catlin, Avery Hairston, Max Nussenbaum, Labib Rahman and Brian Rudolph) who put everything on the line to build startups in Detroit. Shot over 17 months, it’s an honest, in-the-trenches look at what it takes to launch a startup. Directed by Academy Award winner Cynthia Wade and award-winning filmmaker Cheryl Miller Houser, the film celebrates risk-taking, urban revitalization, and diversity while delivering a vital call-to-action—with entrepreneurship at a record low, the country’s economic future is at stake. I recently sat down with Cheryl and Kate and discussed everything from the Denver/Boulder rivalry and talking trash about exes to creating your own “luck” and, of course, Generation Startup. So you still live in New York? And you live in Denver? Kate: I do. More accurately – Boulder. Close enough. How do you like Boulder? Kate: I love Boulder. Actually, most Boulderites would be insulted that you mentioned Denver. It’s very pretentious. Because of the university or something? Kate: It’s such a gorgeous, unique place. Kate: And Denver is the city [laughs]. We love Denver. It’s like a sibling that has a very different personality. Let’s talk about the movie. What paths in your lives drew you to make this film? Cheryl: I had just launched my own company. My eldest son was in a fellowship program called Venture for America that places recent college graduates in startups around the country. They’re in 17 cities across the country right now – mostly in economically depressed cities. The fellows work for two years. They’re hired by startups in those cities and they learn to know what it’s like to be an entrepreneur. Then Venture for America helps them launch their own startups after they’ve worked for two years. I was seeing the extraordinary experience my son was having. He had graduated with a degree in English and at his startup, he was overseeing a lot of their marketing. He had absolutely no idea what he was doing, but he was learning. I met Andrew Yang (Venture for America founder and CEO) and said, ‘I’d really love to follow some of your fellows in one of your cities.’ He was game and agreed to give me editorial control and total access. I brought in Cynthia as co-director. Once we raised the money, we had to pick which city to film in and we chose Detroit. That is how we intersected with Kate. Kate was a VFA fellow in Detroit and we thought she was great. Kate: What brought me to Venture for America was that it was a structured way to launch a career which I didn’t have any experience with. My experience was with non-profits and social activism. I showed up on the scene in Detroit like many bright eyed VFA fellows with no clue what I was doing. I got involved as a community organizer at a tech coding school. I started taking coding classes for free and then got into coding. When they started filming, I had no idea what led them to reach out to me. I think they reached out to a bunch of different fellows to find who would fit with the story they were trying to tell. Cheryl: Everyone in the film is very real. We cast based on people who were comfortable being in front of the camera – who were willing to be vulnerable and open up and let us in on their journey. Obviously, we wanted a really interesting mix of gender, race, all of that. Kate is amazing on camera. Also, as a female coder, Kate is a wonderful role model. Females are such minorities in the tech and startup world. So you were surrounded by a lot of testosterone. Kate: All the time. All the time. That is something I appreciate about the film. When we talk about entrepreneurship, it’s often just through the lens of the white guy that has had a tremendous amount of privilege throughout his life. In this movie, they found that lens through people from different economic situations; from different genders; from different races. You mentioned you wanted people who could open up and be vulnerable. Was that hard for you? Kate: Absolutely [laughing]. I think anytime you open up your deep, dark places, you have no idea how the [final cut] will turn out. I think all of us were a little nervous of how our stories would be portrayed on the big screen. He was comfortable with that. I knew someone having a nervous breakdown wouldn’t be great. But if a company had failed, it still would have probably been a compelling story. Anytime you have someone who steps outside their comfort zone and takes a risk, they’re going to learn and grow from it. It’s really just admirable because most of us don’t. There was some footage that we didn’t put in the film because they were so vulnerable and we didn’t want to embarrass them. There was a huge level of trust because, from that 200 hours of footage, they didn’t know what we would use. Kate: I think that trust grew over time. We got to know the camera crews because they came back again, again and again. They became people we could joke around with. They seemed generally invested in getting to know us and our stories. At first, I was like, ‘everything’s great! I have no insecurities.’ Towards the end, that trust allows you to be more real. Kate: [laughing] It turns out this is kind of hard sometimes. What was hard about the filming? Kate: I would say it was which parts of my life to let them in on. We were talking earlier about there’s a whole portion of footage where I went through this catastrophic breakup with a boyfriend. When they first started filming, I was like, ‘I’m going to leave Detroit and follow this guy across the country. We’re going to get married and have kids.’ Then towards the end of the shoot, we broke up very dramatically. We went back and forth a little bit and that’s not in the movie and I think that’s for the best. I really appreciate that they chose to focus more on our careers. When I’m 46 and probably married to someone else, I wondered, ‘would this be weird that this is documented out there somewhere?’ I guess the same could be said for my career. Am I going to look back at this 25-year-old kid and think, ‘I’m so naïve. I can’t believe that’s on film. So there are scenes on the cutting room floor of you talking trash? Kate: [laughing really hard] Oh I think there is! Kate: I think I kept it pretty clean. I don’t think there’s anything in there with any trash talking, but there was definitely some sobbing – ‘how could this have happened? This is the worst thing that ever occurred.’ I’m not proud [laughing]. I don’t think any of us go through breakups totally cool. We all have our moments. Kate: It’s like your classic mid-20s heartbreak. It has to happen at some point. So was there anything that was hard for you in making the documentary? Cheryl: Everything was hard. And joyful. Like when Max says, ‘95% of what I do all day, I hate, but I love building this company.’ I did not hate 95% of what I did for this documentary. I loved everything, but it was hard. We were making this film for 2 ½ years. I’ve always worked hard in my life, but I was working 16 hour days, 7 days a week like our entrepreneurs. My poor husband hasn’t seen me in 2 ½ years. When filming a doc, it’s risky. You don’t know where the stories are going. You don’t know how the stories will end. It was a super complex film to edit as well. Until the end, I wasn’t convinced we’d have a cohesive whole. It was also super exhilarating and joyful, but also super hard. Like most things that are worth it are. Exactly. I think that’s one of the big takeaways from the movie. People often say, ‘oh, he got lucky. Look at that meteoric rise.’ When people become successful, it’s not luck. It’s not meteoric. It’s hard work. It’s really hard work and maybe a little bit of luck along the way. When you work really hard for something you care about, in the end, there’s nothing more fulfilling. A lot of people don’t understand that. Okay, I’ll stop with my social commentary. Cheryl: That’s why they should see Generation Startup. That’s one of the big themes. I think people have this very glamorized view of startups. Actually, people are working their butts off. As Avery says in the movie that he hasn’t seen his friends or his family in forever. He’s just too tired or doesn’t have time. Kate: That’s something I appreciate about the film too. Watching the film gives me inspiration even though I know these guys. It’s inspiring for me as someone who’s about to jump away from a salaried job to launch my own company. I’ve seen how hard those other guys worked. I know if I work that hard, I will have the same roll of the dice chance at success. As a non-actor, who was it to be on camera and being followed? Kate: Scary. I think the first couple times they filmed with me, I made sure to have a glass of wine before. Cheryl: I did not know that! Are you sure it was just one glass? Kate: Well, I’d have one glass before we started and then another glass as they were filming. It’s hard to be your natural self when there’s a huge camera in your face, especially at first. Cheryl: That camera was not huge [laughing]. Kate: Oh gosh, I thought it was huge [laughing]. Cheryl: It was a pretty small camera. The crew was a DP, a sound person, the director and an AP. It wasn’t a big crew. Kate: You can tell I’m not an actress because I thought it was a huge crew [laughing]. You touched on this earlier, but when people watch this, what do you want them to take away? Kate: I want women to watch this film and see these guys doing it and say, ‘I’m as smart as these people. I’m as creative as those people. I can do this too.’ I want them to see Dextina and me taking risks and say, ‘I can also do that. I’m equally as capable.’ I’m biased because a huge chunk of my life is trying to get more women into the tech world, but I think this film could be a huge tool to accomplish that. Cheryl: Realistically, most people aren’t going to start a company. I think the messages in this film are more universal than that. First of all, I hope people feel inspired to move a little bit outside their comfort zones and take more risks – both in their personal and professional lives. I think most people are held back by fear. If we can help people realize that, even if it’s baby steps, ‘I’m going to try to overcome that fear of failing. What’s the worst thing that could happen if I try to do something that I’m a little afraid of.’ That’s how we as humans grow and evolve. If we don’t conquer things that frighten us, you don’t grow as a person. Generation Startup is now playing in New York, opens in Los Angeles on September 30th and will rollout nationally soon.